Some of us really do love the idea of libraries and their endless rows of books. 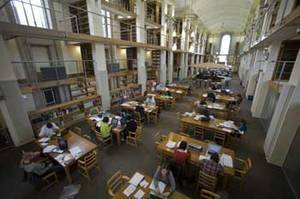 Take the National Library of Wales, for instance, with its cavernously inspirational reading room, and when you need a breath of fresh air, uplifting views of Cardigan Bay – it’s hard not to feel one is on the very tip of Mount Parnassus in such a location. There’s something enthralling about piles of books. But we’re also loving a more minimalist aesthetic, which declutters and is portable, saves the trees, and in these straightened times, offers value for money. Bookish and fusty or slick and a bit too Steve Jobs-ish? Your reluctant columnist sets out answer the question – app or book? App Score – 6/10 (could be better designed; great information). Either way, the concise edition will do fine, including for university level. The Oxford Companion to English Literature really is authoritative and wins over the convoluted, overly detailed entries in Wikipedia hands down. Newly updated, the seventh edition is edited by Dinah Birch. Kept by a desk, it’s almost as good as the Concise Oxford Dictionary of Literary Terms. It’s especially useful if you are poor at remembering the names of characters, require a considered introduction to an author or want a plot summary. Again, the app has a number of problems. Browsing is not encouraged by the design – it’s much more about searching for particular entries. So if you have the space, the book is best (and it’s more comprehensive) but on price the app wins – £8.49 for the app, but a wapping £35 (reduced to £20 on Amazon) for the book. That said, bear in mind that the app is based on an older concise (and therefore shorter) edition. Book score – 9/10 (sorry but the price is a bit steep!). The book version will see you through your degree; the app through your A levels. ← The book is dead – long live the book!